The Orabella's Blog...: Nigeria Wooden Boat Sinks Why Carrying Illegal Migrant To Gabon !!! Nigeria Wooden Boat Sinks Why Carrying Illegal Migrant To Gabon !!! 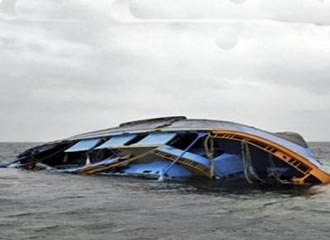 Nigeria Boat carrying 166 people from Oron in Akwa Ibom to Gabon sank during their trip and only two survived the unfortunate incident. The trip to Gabon was to go and find greener pastures but death took 164 lives leaving two to survive. The cause of this incidence was as a result of a leakage into the wooden vessel and this was caused by an engine failure. Lives of women to children from Togo, Ghana, Senegal,, Benin Republic and few Nigerian were taken. One of the survivor said that the their trip to Gabon was illegal and that the wooden boat had traveled through a lonely part of the sea, which is not the normal route it was meant to travel through, hence they remained in the sea from about 9pm on Friday to 3pm on Sunday when the mishap happened. The survivors were rescued by team of Addax Petroleum Company off the shores of the land of Calabar and taken to a private hospital to receive treatment. Nine Bodies has been found and taken to the mortuary. Effort are being made to recover the rest of the body.